For women with left-sided breast cancers, it is critical that their radiation oncologist avoid giving unnecessary radiation to their heart. This can be especially challenging if the woman has undergone a mastectomy and the radiation must be delivered to her ribs and chest wall muscles to eradicate microscopic disease. 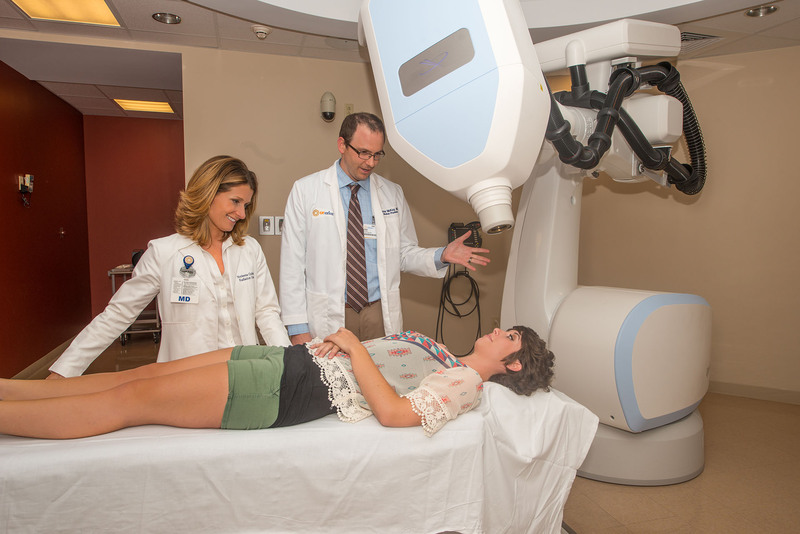 Left-sided radiation treatment can also be tricky if a woman needs radiation to the surrounding lymph nodes, such as those under the arm (axilla) or above the collar bone (supraclavicular lymph nodes). In some cases, the internal mammary lymph nodes need to be treated and these lie directly along the sternum, very close to the heart. When you come for CT simulation, we will create a mold for you to lie in and position you on the CT scanner just as we do for women with right-sided breast cancers. A key difference is that there will be small markers attached to your chest with stickers that will be used to track your breathing. A therapist will then begin to coach you on taking a deep breath and holding it for 20-30 seconds. You will practice with a therapist until you are able to achieve a regular deep breath reproducibly and we are able to track your breathing using the markers. We will then complete 2 CT scans, one when you are taking a deep breath, and the other when you are “free breathing” as you do normally. When a woman returns to our department for treatment, she will be placed on the treatment machine in the same mold made at the time of CT simulation. A therapist will again start to coach her on taking a deep breath and she will practice for several minutes while the therapist confirms that the machine is accurately tracking her respiratory machine. Once confirmed, the radiation will be delivered while the patient holds her breath, safely avoiding the underlying heart.